Yarn Fun For Our CAL….. Yesterday was a successful trip to buy yarn!! I scanned the yarn aisles of JoAnns for quite a while before I decided on the brand of yarn and colors I thought I would love to work with…My final decision was Vanna’s Choice by Lion Brand Yarn… I was looking for something soft and affordable! This yarn was on sale for $2.39(Regularly $3.99) and I had an additional coupon for 10% off my entire purchase,,, for a grand total of$39.32… I decided to purchase 17 skeins… 170 yard each for a total yardage of 2890… I am estimating yardage for the CAL to be 2500-3000 depending on what size hooks are used and personal preference for the size each person may make… There will be some easy stopping points if some participants would like to make it a little smaller… Also another reason I selected Vanna’s Choice was the wonderful array of colors… There were so many to choose from! And… If I need more of any color,,, It is very easily found! My daughter had a hand in choosing these colors… I think she really just wanted to get out of the yarn aisle! I had these colors plus a few more in the basket trying to make my final selection and she helped me narrow it down to these 5 fabulous colors!!! !… I am playing around with the design today and will be getting the pattern started! A Full Materials List will be posted in a couple of days,,, But if you are itching to get your yarn ~this can be a scrap buster along with one neutral or you can choose a color scheme using 3-5 colors plus a neutral! I am really excited about our CAL journey together!!!! How about you?? Love your color choices – those are my colors!! Vanna’s Choice will be easy to get and I like working with that yarn too. Can’t wait to get started. Yes, time for another project! Anxiously awaiting the yarn requirements! I love your color choices and I have used Vanna’s Choice a lot and enjoy working with it. Thinking I might make it a stash buster, though. Guess I’ll wait to decide when I see the materials list! Oooh … I love all the colors! I hope I officially joined the cal. I have loads of yarn and would love to begin. Just waiting for the fun to begin! I love the eggplant and the different shades of grey. Whatever you turn this into is sure to be GORGEOUS! I can’t wait to see it! 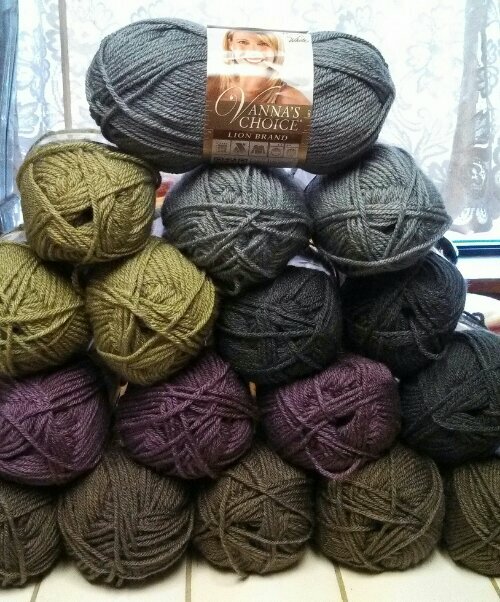 Vanna’s choice is my favorite too for low cost, great color selection, and softness when it comes to craft/acrylic yarn. Lovely selection of colors. What will you be making? I love Vanna’s choice! Well it’s my 2nd favorite next to I love this yarn but the colors all work together and it makes planning project fun! I’ve tried color combo I would have never thought of! I wish I could join in the fun of the CAL but no extra time for me! Thanks… Well Maybe you can just have fun watching the pictures come in on Facebook! Your colors are great but since I have large amounts of scrap Vanna’s Choice I think I will follow along and make a stash buster. I have been wanting to make something big for a while. It may take me longer than everyone else but I am excited to start. Beautiful color choices! They seem to go so well with the season. That yarn looks so yummy. I really wish I could try it out and the colours are wonderful. It is yummy yarn!!! Maybe next time around you can join in… but I totally understand having to much going on! !